This happened to me—I didn’t even know I had this prefpane installed. I ended up performing another Leopard install with the “Archive and Install” option to get around it. Flickr: Don NunnFor the inevitable day when you need to frost 500 dozen cookies. I have decided that every rainstorm is, for Seattleites—residents of a city with a (mostly undeserved) reputation for endless rainfall—exactly like the Deluge of biblical reference. Came in to work tonight to find my desk relocated. Actually this is misleading. I had to move my PC, monitors, keyboard, mouse, chair, file cabinet. Only thing moved for me was the phone, it’s of those new-fangled IP telephony contraptions that has to be set up by a technician so the phone system knows where to send calls dialed in to my desk number, blah blah blah. Anyway. Moved down the corridor from the group office I’d occupied since... must be, oh, January or so, to the former lounge area where my desk was located when I first started here back in December. Nine months and two desk moves later, I end up three feet from my first workspace. It will be nice, however, when my work schedule returns to daytime hours next week and I will see the outside world in daylight during work hours for the first time in what feels like decades. Be weird to be here when there are actual people around. And the light from outdoors! But the blinds, too, very helpful. Tumblr update on Nov 01? He’s not at all pleased about being a cow. defective yeti: Local News: Blows! 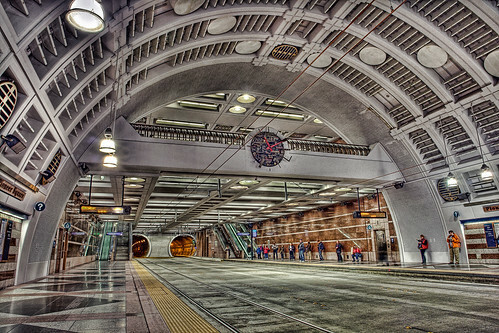 Flickr: Cap'n SurlyLooks like something directly out of Star Wars, but it’s really the downtown Seattle transit tunnel. Normally I’m not a fan of the HDR technique, but in this case it makes a fascinating mix of surreal and detail. Grocery store down the street. I used the self-checkout because the one staffed register had all seven other shoppers waiting in line. Scanned items, placed in bags according to inane prompting by machine which, like all such installations, uses a woman’s voice similar to the “You now have six minutes to reach minimum safe distance” drone from Aliens. Finished scanning bar-coded items, placed small bunch of bananas on scale and typed PLU code 4011, which from years of grocery shopping and watching register operators at their task I have learned is the universal price code for standard non-free-range, non-organic, grown-by-underpaid-workers-in-the-clear-cut-jungle way-too-yellow-to-be-natural run-of-the-mill bananas from whichever vendor is least fashionable at this particular moment because agri-business is of course the scourge of our existence. Instead I pressed “No” and waited for the payment-choice screen to appear. “No,” I said. “I touched that by mistake.” I watched the screen at my station, waiting for it to release operation to me again so I could pay. “You pressed the button that you had coupons,” the attendant said. Accusingly, almost, as if by pressing that button and immediately trying to cancel I was somehow attempting to cheat the store when customers can’t even scan their own coupons anyway. “Yes, I pressed it by mistake, like I just said,” I said. He touched his console, the Triple-Secret Code to release the transaction back to me. Watched me as I chose payment method, paid, pulled bags off the rack, walked out of the register area. On the drive home I kept one eye on the rear-view mirror, the other on the road ahead, watching for the black cars that would indicate I had been Marked. For Surveillance. No black vehicles, and no silent helicopters when I got home. Flickr: Don NunnKroger’s contribution to the month of events and products geared toward fund-raising and education. I only got to work—for my 00:00-08:00 shift—about 15 minutes ago. Bonus, however, of late wake-up even on a wacko work schedule: Traffic-signal timing works greatly in your favor when you’re nearly two hours late for work. Usually when I leave for work, I have to stop for traffic lights at some point along Mercer Street. Often that stop is at Mercer and Dexter Ave N. The rest of the signals along Mercer are timed so they turn green at about the same time as the light at the Dexter intersection, so barring slow or idiot drivers, I don’t have to stop again until I exit SR 520 at NE 51st St, where the signal timing has been changed lately to an interminable stop at any time of the day or night. Tonight, however, I only had to stop briefly at the stop sign at the base of Taylor Ave N for the left turn to Mercer. Zipped down Mercer on all green lights, flew off 520 at 51st, happened to follow a vehicle already waiting for the left-turn signal. I guess alarm-clock confusion translates to good traffic karma at least once in a while, eh? Brief stop at the grocery store on my way home from dinner with Katharine. One register open. Not unexpected, Saturday after 21:00 and there aren’t all that many people in the store. Immediately ahead of me is a single man with what looks like ingredients for his family’s breakfast tomorrow—pancake mix, syrup, orange juice, and so on. Ahead of him is a couple who are buying baby food, diapers, cigarettes, and condoms. But they hit a snag. The woman’s credit card has been declined. The transaction denial doesn’t give a reason for the denial, merely states the fact of it. They sort through the items, linger a bit over the baby food and diapers, probably thinking of the hungry and dirty child (who must be at home, or maybe in the car... aaiieee). They end up choosing the ciggies and condoms and leave the baby items behind. how many protocols I may be violating when I check my Gmail account on my Palm OS-based Treo as I wander down the hall to the kitchen in a Microsoft facility.